See or work on the same files on all of your computers, from any internet connection. Log in to your personal portal and view all of your files online from any web browser. Free apps for iOS, Windows 8 and Android let you view your photos, music, movies and documents from anywhere! Use our specially optimized mobile site for Blackberry and other mobile devices. Edit Office documents, arrange photos and upload new files to your cloud storage from any web browser. Upload your photos to Facebook and Flickr with one click - online file storage that sets your files free! Need to revert a change you made? File overwritten? No problem - we keep up to 30 versions of any file in the cloud. Deleted files are kept for 30 days. Restore files or entire folders from the cloud at any time. 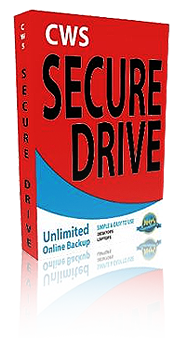 Email files to your CWSC SecureDrive Plus© account and they are uploaded to your storage area. Our data centers have super fast connectivity, so there is no limit on your transfer speeds or bandwidth available for your data transfers. 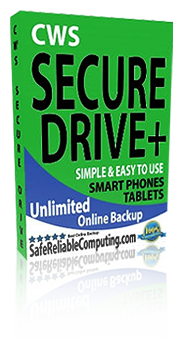 Works on Mac and Windows CWSC SecureDrive© works with either Mac or Windows computers. Requires Windows XP or later, and Mac OS X 10.6 (Snow Leopard) or later.